This rich and immersive journey will take you off the beaten track in an intimate small group setting. You’ll travel in luxury 4WD vehicles and stay in boutique retreats, lodges and resorts with gourmet cuisine to match. This journey offers the perfect balance of freedom from the stress of holiday planning, and just enough flexibility to shape your journey with a choice of optional experiences. Your expert Travel Director and Driver Guide will take care of everything so you can sit back and be inspired by the journey. Explore the highlights and hidden treasures of the Red Centre on a small group journey via 4x4. 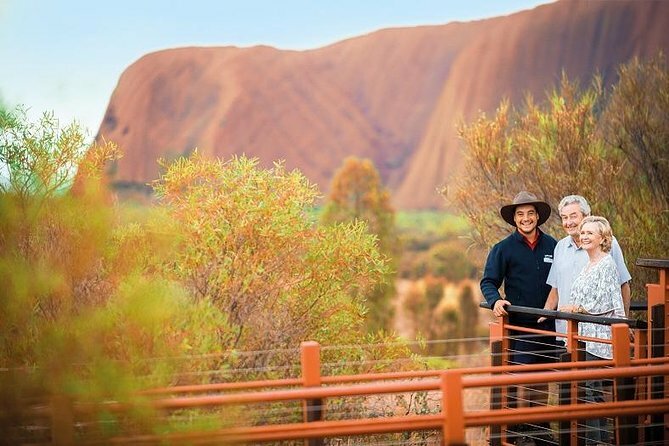 Immerse yourself in local culture and ancient traditions and come away with a deeper understanding of what makes the Red Centre so unique and special. First class dining and luxury accommodations round out the experience. Great trip with James as our guide. He was very knowledgable about the local area and the traditional owners indigenous people. Everything ran very smoothly with amazing meals including two with nature produce. Hotels were of a very high standard. It even rained in Alice Springs - first time in 8 months!